PHILADELPHIA, PA – November 27, 2018 – Janney Montgomery Scott LLC (“Janney”), a leading full-service wealth management, financial services, and investment banking firm headquartered in Philadelphia, PA, welcomed Mary Jane Darby, Rob Kanzer, and James Still to the Firm’s New York office this month. The group has over 50 years of combined experience in the industry with a strong advisory practice that supports higher education institutions. Vivian Altman, Janney’s Head of Public Finance, agreed. Mary Jane Darby’s new role will be Managing Director and Head of Janney's Higher Education and Not-For-Profit Advisory Group. As a Managing Director, Mary Jane’s focus will be on overseeing client relationships and assisting institutions in developing and executing capital strategies. With over 30 years of public finance experience, Mary Jane’s technical expertise and market intelligence makes her a strong advocate for clients. Mary Jane's career includes eight years with the New Jersey Educational Facilities Authority (NJEFA), where she completed over 100 higher-education financings totaling over $7.1 billion. During her time at NJEFA, Mary Jane also coordinated efforts to address variable rate and insured products in the wake of the financial crisis across the 11 senior public institutions in the state. Most recently, Mary Jane worked for seven years at Prager & Co., LLC, serving as Head of the National Higher Education Financial Advisory Practice that included clients such as Northwestern University, Rutgers University, and University of Nebraska. Mary Jane is a graduate of Lafayette College with a B.A. in Economics and Business. She is a FINRA registered representative and municipal advisor. Janney welcomes Rob Kanzer as Managing Director in Janney's Higher Education and Not-For-Profit Advisory Group. As a Managing Director, Rob’s focus will be to oversee client relationships to create alignment between financial and strategic plans. His work includes capital planning, rating strategy, and financing strategy execution. Rob also has extensive experience with central bank frameworks including policy development, modeling, and implementation. Rob is a frequent presenter at industry conferences including EACUBO, OACUBO, and the Treasury Institute for Higher Education’s Annual Symposium on topics ranging from academic medical centers to shared services for higher education. Rob’s career in public finance started in 2001 with Bear, Stearns & Co. where he worked on bond issues for the City of New York and tobacco securitization issues throughout the country. His background also includes municipal derivatives experience at Citi with a primary focus on healthcare. Most recently, Rob worked for six years at Prager & Co., LLC, providing financial advisory services to higher education and not-for-profit clients throughout the country, including University of Chicago, University of Cincinnati, and University of North Carolina at Chapel Hill. Rob is a graduate of Boston University with a B.S. in Business Administration and a concentration in finance. He is a FINRA registered representative and municipal advisor. 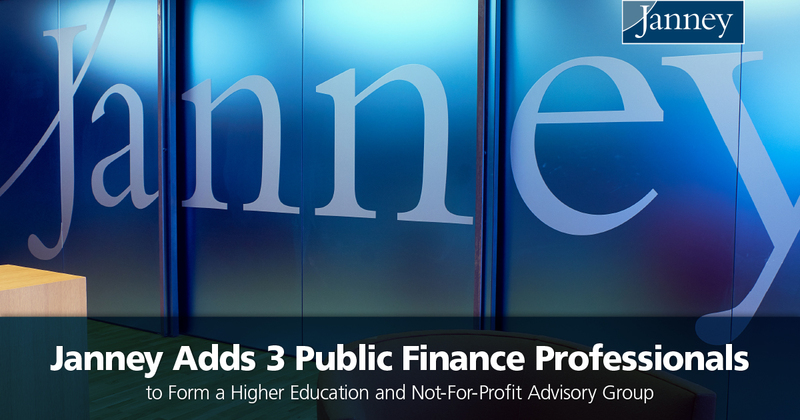 James Still joins Janney as Director of the firm’s Higher Education and Not-For-Profit Advisory Group. As a Director, James will focus on creating an analytical framework for clients to aid in strategic decision making. James has extensive experience in financial modeling to assess the impact of institutional strategies related to capital financing, endowment spending, institutional cash flow, and liquidity. James has a particular expertise in higher education credit rating strategy and analytics, and works with numerous clients to manage rating agency relationships and evaluate rating agency metrics. He is the co-author of a chapter on rating agency methodologies in the Update to the Seventh Edition of Strategic Financial Analysis for Higher Education. Prior to Janney, James worked for six years at Prager & Co., LLC, providing financial advisory services to higher education and not-for-profit clients throughout the country, including Northwestern University, Ohio University, Wildlife Conservation Society, and Rutgers University. James is a graduate of Indiana University with a Master of Public Affairs concentrated in Public Financial Administration. He is a FINRA registered representative and municipal advisor.